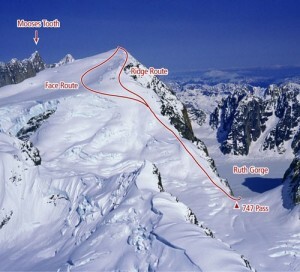 Mount Dickey (9,545’) holds one of the most impressive facades in all of the Alaska Range. Rising 5,000 feet straight out of the flat glacier, its east and south faces dominate the Ruth Gorge. Massive buttresses, fractureless planes, and insanely steep couloirs are intricately mixed to form a seemingly impenetrable bastion. It almost seems like cheating that you can easily walk up the western backside to the top of such a behemoth. Mount Dickey was named after William A. Dickey (1862-1943). Dickey was a prospector who in 1896 named Mount McKinley after presidential nominee William McKinley of Ohio.